The world's most cost-effective, all-IP BGAN machine-to-machine satellite terminal with exceptionally low power consumption. Iridium's newest and toughest satellite phone. New lower price! The new IsatPhone 2 handheld satellite phone. A robust handset, unrivaled battery life, excellent voice quality. 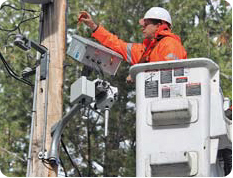 OCENS Land Mobile provides scalable satellite communications solutions suitable for utilities of any size. Utility applications include: Smart Grid, M2M, data backhaul, failover communications for disaster recovery, remote surveillance, and voice and high speed data for the mobile workforce. The satellite networks are resilient, versatile, inherently secure, and compliant with NERC standards. If you are a small, medium, or large utility, please contact OCENS Land Mobile to learn more about the satellite solutions available to you. For video surveillance, the Hughes 9201 and the Thrane&Thrane Explorer 700 terminals can provide a dedicated streaming IP connection of up to 384 kbps and can be configured to transmit on-demand or with automatic triggers. For backup communications, the Hughes 9202 and Thrane&Thrane Explorer 700 provide a background IP connection of to 492kbps and a simultaneous voice channel. Both terminals have an onboard WiFi broadcast and an analog RJ11 port for POTS and PBX integration. The 9202 is extremely compact, whereas the Explorer 700 has a detachable antenna for remote placement. The Wideye Safari vehicular BGAN terminal is the ideal choice for the mobile workforce. It is a competitively priced and very compact two-piece terminal. The active antenna tracks the satellite automatically so you can use it while moving and never need to point the antenna. The terminal provides a background IP connection of 464 kbps and simultaneous voice channel and features built in WiFi and GPS output for fleet tracking. The antenna is a magnetic mount so is very easy to install and there is no need to perforate the body of the vehicle. The terminal is powered by 12-24VDC and includes a standard auto adapter. IsatData Pro is a two-way small packet data service over the Inmarsat satellite network. IsatData Pro is used to remotely manage fixed and mobile assets anywhere in the world. The terminals are low-cost, efficient, and programmable and the airtime plans are cost-effective with pooling options available. The maximum receive packet size is 10,000 bytes and the maximum send packet size is 6,400 bytes. Average latency is 15-45 seconds. IsatData Pro is the ideal, cost-effective solution for remote, small packet data applications. Iridium provides the only handheld phones that will work anywhere on the earth’s surface. The 9575 is the only satellite phone that includes built in automatic GPS tracking, SOS button, and an IP65 ingress and MIL-standard durability rating. Docking stations and antennas are available for fixed or vehicle mounting. The IsatPhone Pro 2 is a competitively priced satellite phone and its features include a color LCD screen, Bluetooth, and an extended battery life. It is a very rugged, durable, and weatherproof handset and docking stations and antennas are available for fixed applications.